Here is a response to a comment left on (was that) todays posting by a chap facing the sudden death of his father. Because the subject of grieving comes up a lot I thought I’d answer part of the comment in a posting. One thing that has particularly troubled me is my lack of grief and it is interesting to read your comment about shock taking its time to work through. I know it might seem odd however death, even a sudden death, may not be followed by grief. After both my mother and my father died I was surprised I was not finding myself ‘falling apart’. 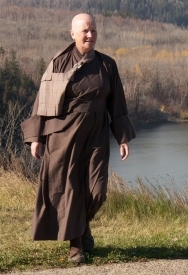 I took council in a senior monk and was told not to expect to grieve and not to be concerned if I didn’t. In addition a friend mentioned that perhaps I’d dealt with that which tied us together and I could simply accept the death and moving on. This lack of grief seemed a bit surreal at the time I must say. So perhaps the answer is to take life as it comes at you. What else is there to do? Later, while resolving the family home and its contents, I did have loud howling sessions but gradually those spontaneous outbreaks became less. Then perhaps three years after my father died I noticed that the colours in nature where markedly brighter, and illuminated some how. I understood then that my senses had been dampened down somewhat, not depression exactly but close probably. The compassion scriptures would be the Litany of the Great Compassionate one and the Scripture of Avalokiteshwara Bodhisattva. The words for both scriptures can be found on the Shasta Abbey web site. I greatly appreciate your comments Rev Mugo. Thank you for your excellent work in producing this weblog. It is extremely useful for all of us ‘outlying’ practicioners who are too distant from any local groups to have regular sangha contact. Many thanks Calum. I see that Blogger has added the ability to upload video. This news comes just days after I found my video camera. Sadly I don’t think I’ll be uploading any video any time soon however I’d love to show people what it’s like here in the moors of Northumberland.